Replace your sneakers often. At least after every 250 – 500 miles of walking/running. Stair climbing is a low-impact alternative to running. Choose exercises that you enjoy doing. You’ll be more inclined to stick with a fitness regimen when it includes things you like to do. Change your fitness routine every 4-6 weeks to prevent a workout plateau. Strive to include total body workouts. These include: cardiovascular exercises, strength training (both upper and lower body), core training and stretching/flexibility. Measure your exercise intensity. There are several methods: heart rate, rating of perceived exertion, talk test. Whenever possible, take the stairs instead of an elevator. Stretching and flexibility are very important aspects of good physical fitness, so don’t overlook them. Ideally, you should stretch before each workout (both cardio and resistance exercises) and after each workout. If you can’t do both, then make the after stretching a priority. When stretching before a workout, it’s best to stretch after you’ve gotten warmed-up for about 5 minutes (your muscles will be looser). When working out on cardio equipment (e.g. elliptical trainers), don’t lean heavily on the handrails. This will reduce the amount of calories you burn. Save time at the gym with this 10-minute cardio/sculpt session: Hop on a treadmill holding a three- to five-pound dumbbell in each hand, and set the speed to a brisk walk. Do a one-minute set each of shoulder presses, biceps curls, triceps extensions, side laterals, front laterals and standing triceps kickbacks one after another as you walk. I’s an amazing upper-body challenge that also gets your heart pumping. Do this series two or three times each week. As you improve, work up to doing four-minute sets. You don’t have to be a fitness saint to get results. Follow the 80/20 plan: Eighty percent of the year, you’ll exercise regularly and eat well. Know that you’ll slip 20 percent of the time due to holidays and work deadlines. When you accept that fitness isn’t an all-or-nothing proposition, you’re more likely to stick with it for life. Sit on a stability ball to strengthen your core, and keep dumbbells or exercise tubing at your desk. Squeeze in 12 to 15 reps of exercises like dumbbell curls, overhead presses and ab crunches; aim for two or three sets of each. 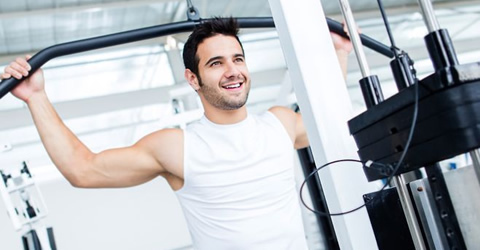 This gives you more freetime to fit in fun workouts like biking or tennis. Your body needs them to fuel a workout, so reach for fruit or high-fiber crackers an hour beforehand. If you’e exercising for 90 minutes or longer, include some protein so that the carbs break down more slowly, giving you longer-lasting energy. Your best bets: low-fat cheese and crackers, trail mix or half of a peanut butter and jelly sandwich. Don’t relax your abs as you lower your chest away from your knees during a crunch — you get only half the ab-toning benefit! To get the firmest abs possible, you need to sustain the contraction on the way down. Squat-thrust push-ups get you in great shape because they work your upper body,core and lower body and improve agility, strength and endurance all at once. From a standing position, bend down, put your hands on the floor shoulder-width apart, and jump your feet back into plank position. If you’re strong, cross your ankles; otherwise, jump your feet wide apart. Do a push-up, then jump your feet together or uncross your ankles. Jump your feet back to your hands and stand up. Do eight reps total, rest for one minute, and repeat.